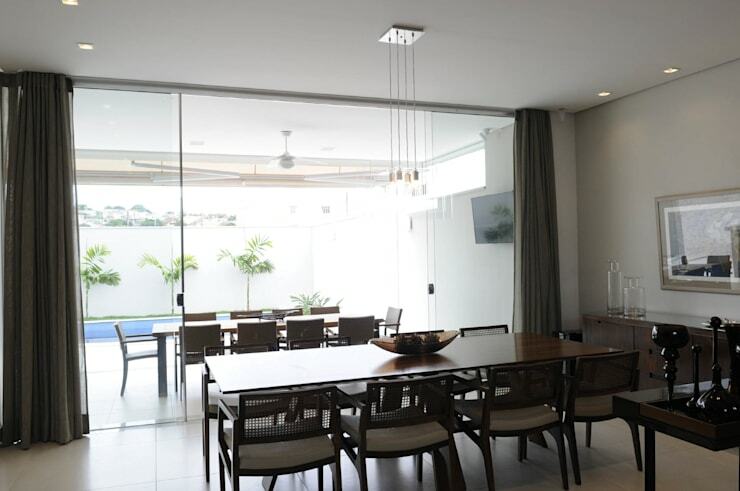 Join us on homify 360°, where we set foot in sunny Passos, Brazil, to locate a modern residence that showcases a pretty facade – and then completely turns the tables on us once we enter the interiors! A/ZERO Architects deserve the credit for this 460-quare metre creation. The element of surprise seemed to be the theme of their design, because while the exterior facades of this house are closed and quite shielded from the outside, the interiors are just the opposite: open and seamless. But it is not just the layout that has us floored. The house flaunts a careful selection of materials that combine superbly with the white walls and neutral tones. It is a modern dance that is carried out uniquely between the different divisions and the relevant connections, resulting in a most interesting home. But enough chattering, time for some visual evidence! 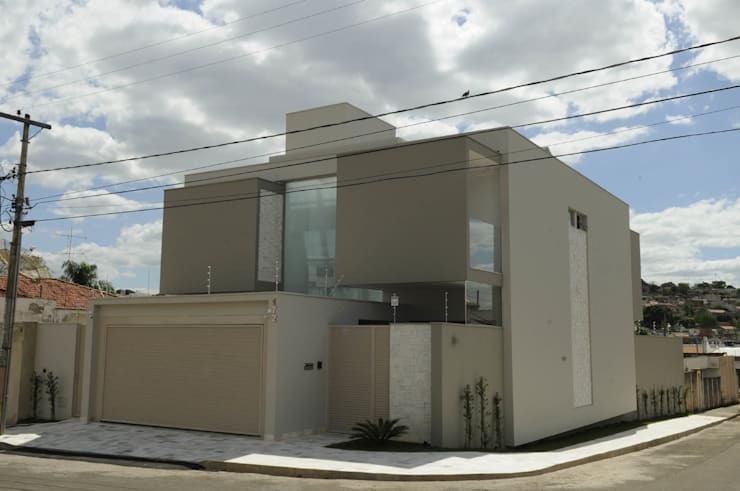 Located on a corner, the house’s facade is a modern combination of different-sized cubes and blocks. With its two sides facing the street, nobody can be blamed for getting a shunned feeling when looking at the facade; although beautiful, it is not exactly inviting. 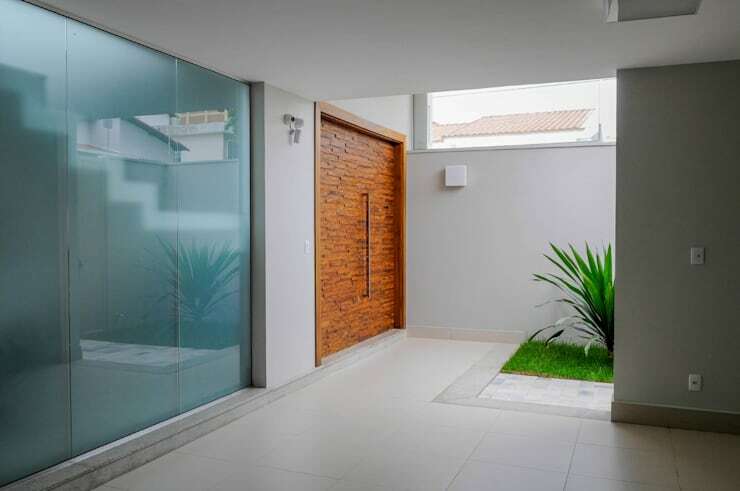 Only a few surfaces are made from glass, yet these mostly mirror the exterior street and sky, with not a lot of hints as to what lies behind those exterior walls. Behind the exterior wall is the main entrance, announced in a warm and welcoming tone of hot timber. With its brick-like structure, it contrasts most effectively with the rest of the surface areas. We’re inside, and it’s like we’ve entered another house. The interiors are sleek and sophisticated, yet far from bland. Stylish details are to be seen everywhere, from wall to floor and from ceiling to table. 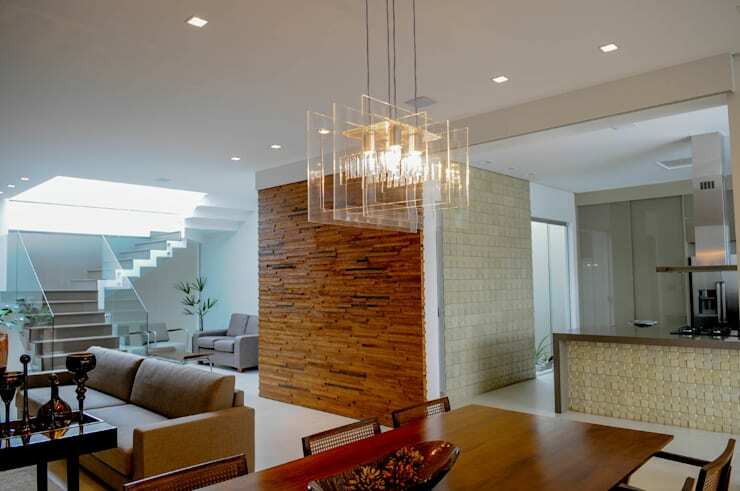 Those snow white walls offset beautifully with textured surfaces, like the timber panels shown above. The striking staircase with its two-quarter landing design makes for a stunning addition to the interiors. 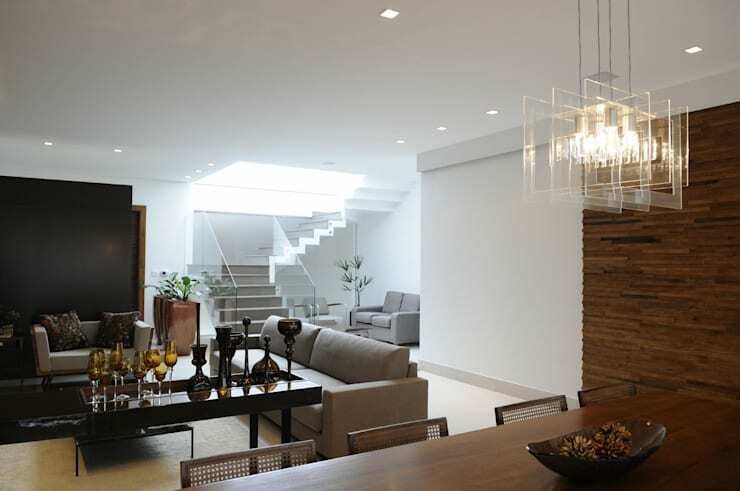 And those thin glass balustrades are nothing short of perfection, exuding an undeniable ambience of contemporary class. We move slightly to the right, and see that it is, in fact, an open plan. The living room, dining space and kitchen area all share the same layout, making for comfortable and seamless movements from one to the next. Isn’t that what the social hotspot of every home should be? It would seem that every room has opted to include a bit of texture, not the least of which the kitchen. That select wall and kitchen island boast strikingly patterned surfaces in a tranquil cream, made that much more eye-catching by the fact that the rest of the kitchen seems to be smooth and light. And behind the dining table? A generous wall of glass sliders that allow access onto the patio and garden. Thanks to the recessed heads and sills on the glass sliders, the feeling of a seamless connection between the interiors and outside is excellently enhanced. We have a majestic collection of dining rooms here on homify, so be sure not to skip over them! We would never dare to leave without a glance at what goes on by the pool – and we’re sure glad we stuck around, because this is just too stylish to pass up. 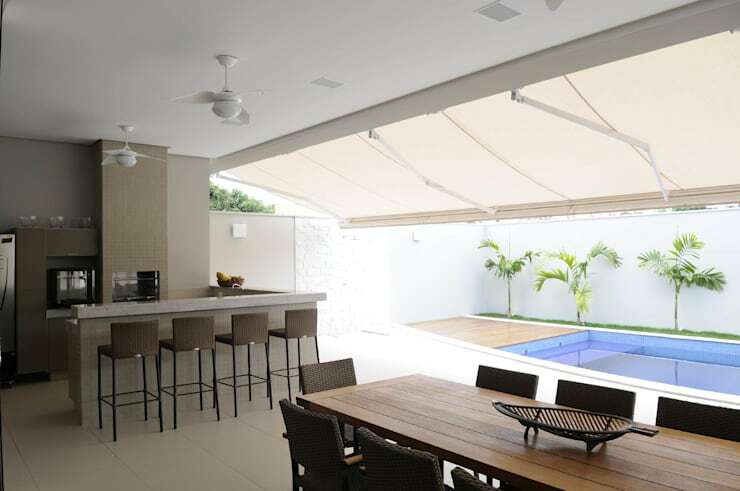 The outside dining area is connected to an exterior kitchen / bar area, complete with barbeque facilities. Is this not the most glamorous way to roast a steak? We love that high ceiling with its crisp white tones and dangling fans, making us forget for a split second that we are, indeed outside. And if that delightful wooden deck by the pool’s edge does not entice you to relish a quick dip and/or tanning session, nothing will! If you thought that was one stylish surprise, then check out: The Surprise Behind Brick Walls.